The material used in this beautiful top handle handbag is soft calf leather, making the bag extremely durable as well as pleasant to the touch. To add to the texture of the bag a different color piping was added to the stitching. This is a small and often overlooked detail, however, it makes for a much better look and sturdier feel. This lovely pink top handle bag is a stunning piece of design and craftsmanship and a trademark of the high quality product that Miu Miu constantly puts out. 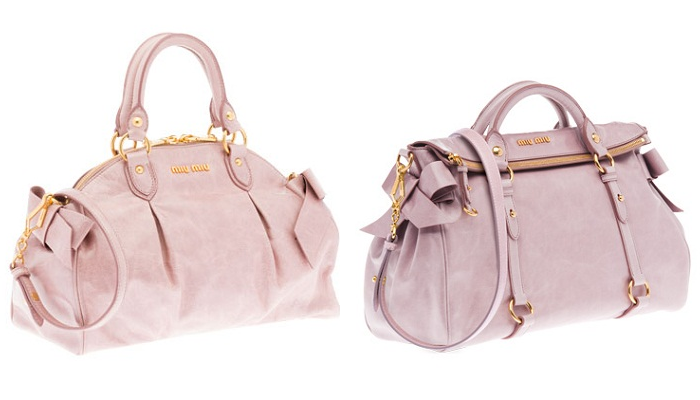 The bag is a light shade of pink, making it ideal for any sort of casual occasion. You can wear it almost anywhere, from a casual run to the supermarket to brunch with friends or even to work if your workplace doesn’t have too rigid dress rules set in place.The front pocket of the bag has a snap-lock closure, so you know your possessions are safely placed inside your bag. The clever snap-lock system also allows you to have easy access to whatever you’re carrying in the bag so that you won’t have to pause from what you are doing to open your bag, simply press and release. The bag’s measurements are 12.2 inches in length, 9.6 inches in height and 6.3 inches in depth. The inside of this medium to large bag offer a lot of cleverly designed space like some small zip and open pockets , where you can put away your tech gadgets, make-up wallet or anything else you might be carrying and not have to go through your entire bag to find them. The Miu Miu logo is also cleverly and discretely embossed on the bag’s bottom feet. This is a small detail that the owner of the bag will love without making too bold a statement like other giant logos place on the snap-lock. The hardware of the bag has a glossy gold finish that has been dulled down to not be ostentatiously shiny. The Matelasse nappa clutch is certainly a purse that will catch people’s eye. Its soft leather with the cotton satin lining makes it very comfortable to the touch and very easy to wear. It is a small purse, measuring only 11.8 inches in length and 7.5 inches in height so it’s definitely more appropriate to smart casual or elegant attires. The inside zip pocket and cell phone pocket will ensure the fact that your essentials such as wallet or electronic devices are safely secure inside the handbag. There is also a subtle metal lettering logo on the outside which shows that you are wearing a designer purse but it’s not big enough to be tacky.Sometimes you need more than a purse to make your outfit stand out, sometimes what you need something completely extravagant to match a wonderful outfit. This purse is certainly extravagant but without being too much. It has simple and classy lines, it’s not your usually fold over purse as it maintains a smooth and straight line in its design. The soft green shade allows for a very unique touch to any outfit, a touch that will definitely be appreciated by those who want to feel a bit more special and who really want to make sure that they stand out in a crowd. The golden hardware makes a beautiful contrast with the colour of this lovely clutch, making it a bit more opulent but not too much so that it doesn’t look like you are trying to stand out. While the sleek look works great for some purses and handbags this patterned model has a lot more character and certainly makes the overall design seem more interesting, while keeping things a little toned down. It provides a tasteful alternative to those small boring clutches that everybody chooses for their evening wear.